Warning! - Messages entered here will be sent directly to our web host for investigation. 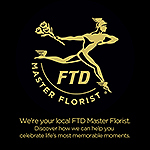 Order inquiries and general floral assistance will not be addressed by our web host or routed to us. For floral or order inquiry assistance please use the above message section (part 1) for sending us (Petals) your inquiry.